HOFOR, Greater Copenhagen Utility, is the metropolitan area’s utility company. HOFOR is municipally owned, where the ownership of the water and wastewater services are shared between 8 municipalities. HOFOR also provides district heating, gas, district cooling as well as being an energy producer from both wind turbines and a biomass power and heating plant. HOFOR sends more than 50 million m3 of water out to customers per year. The average water consumption is now below 100/l/cap/day. The drinking water supply is based entirely on groundwater and the government’s official position is that drinking water should be based on pure groundwater which only needs simple treatment with aeration, pH adjustment and filtration before it is distributed to the consumers. Right up until 1995, 93 discharge points discharged Copenhagen’s sewage into the harbour. During heavy downpours, which put pressure on the city’s sewers, a mixture of sewage and rainwater spilled into the harbour. Therefore, HOFOR began to build a series of large underground reservoirs where rain and sewage could be retained when the sewer system is overloaded due to rain. Today, there are 12 of these basins (the largest is called the Colosseum), and they keep the harbour clean more than 95% of the time during the bathing season. 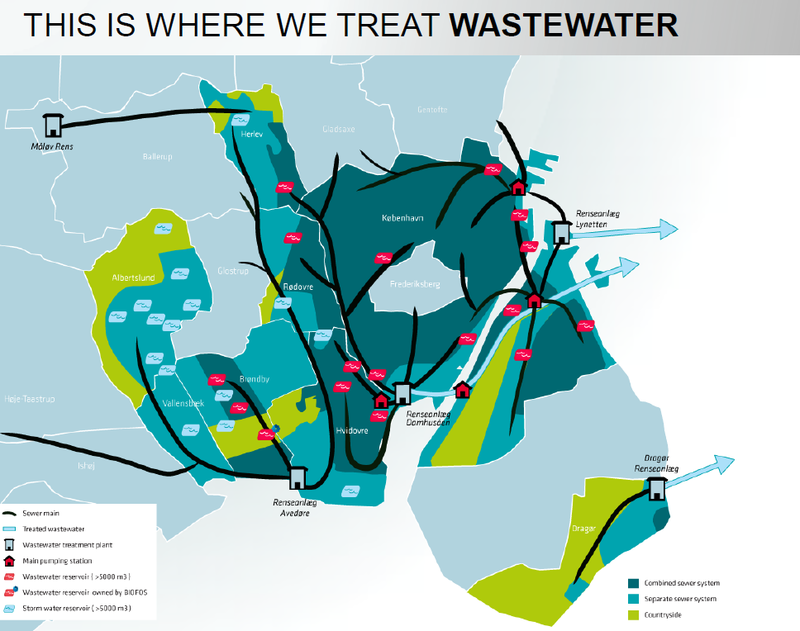 Wasterwater is directed to four wastewater treatment plants that are operated by a separate publically owned company, Biofos. Since 2002, the City of Copenhagen has opened three harbour baths at Fisketorvet, Islands Brygge and Teglholmen, and two urban beaches at Amager Strandpark and Svanemøllen, with more on the way. An example of a bottom-up initiative that the city stimulates is at Kalvebod Brygge, where in the midst of one of the city’s bustling new business districts, an innovative group of residents has created harbour gardens (maritime kitchen gardens), where mussels, oysters, seaweed and fish are produced on platforms floating in the harbour. An effective warning system estimates the water quality in the harbour on a daily basis, allowing the City of Copenhagen to close the harbour baths immediately, when the EU Bathing Water Quality demands are not met. The aim is 3-5 closing days per bathing season (out of 100 bathing days). Until now the actual number of closing days has varied between 1 and 10. The city is responsible for the warning system and is issuing statements on bathing water quality on a home page and an app, daily in the bathing season. HOFOR’s goal is to create sustainable towns and cities through long-term supply solutions that are green, safe and inexpensive. Together with the municipalities, the utility develops ambitious climate adaptation plans with the aim of climate proofing the city in the most green and socioeconomic efficient way. The water supply in the City of Copenhagen is produced from groundwater extracted outside the City, and accordingly, protection of groundwater is outside the City where the Water and Nature Plans (in EU: River Basin Management Plans) form the basis for municipal action plans. The Water and Nature Plans are prepared by the Danish EPA to implement the EU Water Framework Directive, which was adopted in 2000 to ensure that Denmark achieves a “good quality” aquatic environment before 2015. HOFOR is to obtain water abstraction permits from municipalities outside Copenhagen, where water is abstracted. Water abstraction is part of the Water and Nature Plans. The total water tariff in Copenhagen 2017 is EUR 5.17/ m³, set annually by the city government based on HOFORs proposed activities for the coming year. Consumers are informed of their consumption habits and changes in the water tariff on the Municipality and HOFOR homepages and in connection with the billing.  The tariff consists of drinking water supply, discharge of wastewater, green taxes and VAT. The green or environmental taxes consist of tax on: energy consumption (CO2-tax), environmentally harmful compounds in consumption or production, discharge of polluting compounds and limited natural resources (like water). For example there is a tax for water loss and discharge of nitrogen and phosphorous. In addition there is a fee for having a water meter. A new regulation on financing cloudburst management was adopted in spring 2014 stating that interventions to limiting the consequences of extreme storm events could be financed through the water tariff. This means that introducing new infrastructure to manage cloudbursts became a new activity for HOFOR. The great loss to the city (over 90.000 insurance claims) during the last cloudburst event and a “green” orientated government resulted in a relatively swift decision supported across the parliament. The city government then passed the actual proposal to cloudburst proof the city, again with broad political support. HOFOR calculated the impact on the water tariff from financing implementation of the Cloudburst Management Plan for Copenhagen City, which depended on implementation time. With a timeframe for implementation of 20-30 years the impact was politically acceptable. The Plan was presented on ten local public hearings (one for each major catchment area) and on the city’s homepage where any interest group could comment on the proposed Plan before final decision in the City government. So many people were reached and the increase in water tariff was also compared to potential rise in insurance cost for protecting buildings, property and infrastructure. Involvement of local community on street/area level is the key to popular support/ownership of the cloudburst projects on the city surface (as opposed to pipes and tunnels). By means of politically adopted water supply plans, the City of Copenhagen sets out guidelines for the supply of drinking water which are adopted when there is a need for new plans, and not according to an established interval for revisions. As there is sharp focus on limiting the quantity of drinking water transported from the suburban municipalities to Copenhagen, several goals have been adopted, focusing on limiting water catchment for drinking-water purposes. This is an advantage for the groundwater resource, energy consumption, and the volume of wastewater needing treatment. In order to limit carbon emissions from the operation of pumps, etc., HOFOR has set up wind turbines and solar panels on the well fields. In 2006, to reduce water consumption, the City of Copenhagen adopted a goal for water consumption according to which household water consumption was to be reduced to 110 l/cap/ day before 2010. For businesses the target was 34 l/cap/ day. In 2010 household consumption was down to 108 l/cap/ day and for enterprises consumption was reduced to 29 l/cap/ day. As mentioned before the household consumption is now below 100 l/cap/day. In addition to support for the establishment of water-saving toilets and individual water meters, the City of Copenhagen carried out a two-year campaign to motivate citizens to reduce household consumption. The campaign involved information on how to save water, shared on websites, Facebook, fun runs, competitions and events in the city. A plan was adopted to provide financial support for the establishment of installations to replace drinking water extracted outside the City with grey water extracted within the City, from roofs, or, for example, and/or wastewater purified through a UV filter. Such measures help to protect the groundwater resource where drinking water is extracted and to minimise energy consumption when transporting water into the city. Most of the water cannot be used as drinking water, but may be used as process water in companies and thus replace water that can be used as drinking water. Under Danish legislation, all properties connected to common waterworks must have water meters installed at property level. Properties with several flats are, however, only required to install one water meter at property level. As individual settlements at flat level have a positive effect on water consumption, the City of Copenhagen has agreed that water supply companies must allocate a pool of EUR 0.3 mill. annually to support establishment of individual water meters and water-saving toilets. Housing associations have obtained savings up to 20% of water consumption when establishing individual water meters. HOFOR cooperates with housing associations in providing district heating and climate change adaptation through rain water management on the surface. Drinking water that is not measured is made up of water that is lost in the distribution system because of leaks, water used for fire extinguishing, cleaning of wires after wiring work and any measurement errors by the water meters. The unmeasured consumption accounted for approximately 7% of the City’s total consumption. The City of Copenhagen has also been working to protect soil and groundwater within the City borders for several decades. The work is being carried out to be able to use the groundwater resources under the City in the long term, but also to protect the overall water cycle against contamination. The work includes policies and adopted strategies to ensure that municipal care for areas without the use of pesticides and by minimising the use of salting, contributing to level 2 of the IWA Principles for Water-Wise Cities, water-sensitive urban design. The City also carries out annual pesticide campaigns to convince citizens to reduce their private use of pesticides. In addition, the City has put in considerable effort to remediate existing soil and groundwater contamination in the city and to prevent new contamination. This is done through remediation projects, restrictions on how to use contaminated soil and building waste in connection with building and construction work, as well as environmental inspection and approvals of the enterprises in the city. There is also focus on reusing as much of the remediated soil and the clean building waste as possible, in order to limit carbon emissions for transport of excavated material. This intensive environmental protection work protects the health of citizens, as well as the ground circuit and water cycle so that the city will be even cleaner in future. The City of Copenhagen has prepared a Climate Adaptation Plan to safeguard the city against climate changes, enabling HOFOR to manage more and heavier rainfall, rising sea levels and warmer weather. On 2 July 2011, Copenhagen was hit by a cloudburst so extreme it permanently changed the way the utility handles downpours in Danish cities. Copenhagen resembled Venice, with every street a canal. The rain gauge in the Botanical Gardens in Central Copenhagen recorded a record-breaking 135 mm of rain in just a few hours. The entire city was flooded and the damage caused has been estimated to amount to EUR1 billion. 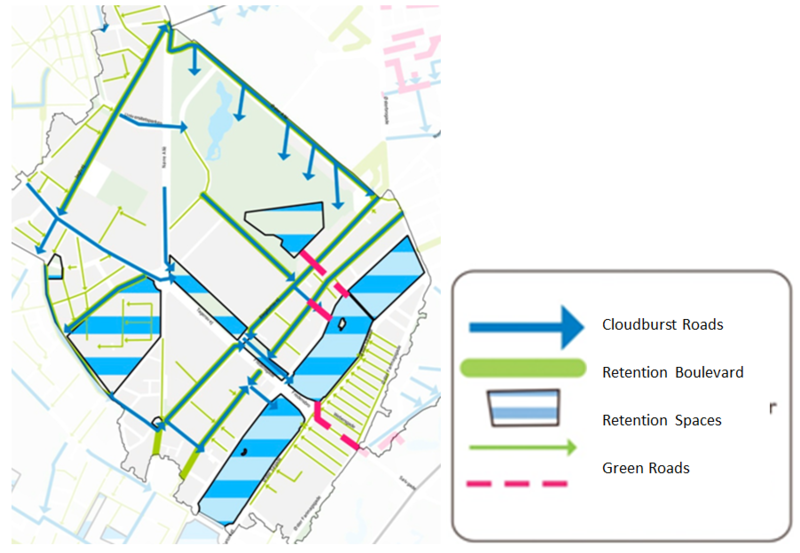 In the wake of the disaster, the City of Copenhagen and HOFOR agreed on a EUR 1.3 billion Cloudburst Management Plan, with a 20- year timeframe to make Greater Copenhagen more resilient to cloudbursts in particular and heavier rainfall in general. Sewer and storm water management has traditionally been financed through water tariffs. Surface solutions, such as canals, retention basins, etc., are also financed through water taxes, but this is only permitted if they can be clearly distinguished as storm water management, and do not have recreational value. This is because urban space improvements must be paid for by the city – not by the utility. However, since climate change adaptation calls for solutions that are inventive and comprehensive, compartmentalizing solutions may lead to less than ideal solutions. HOFOR has worked to change the legislation on financing adaptation, and now storm water management solutions that also improve the urban space – so called ‘mixed projects’ – may now be financed by HOFOR while still owned, constructed and maintained by the city. Projects on privately owned land are subsidized by the utility. The main focus of the Cloudburst Management Plan is to direct rainwater by gravity towards the nearest body of water, mainly the sea, if at all possible. Surface solutions focus on creating ‘blue and green spaces’ that integrate water in the urban space and create green corridors that increase biodiversity and also combat urban heat island effects. 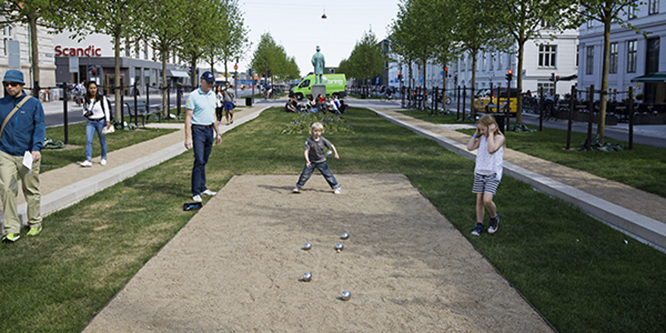 Water retention parks have been completed at Sankt Kjelds Kvarter, Sankt Annæ Plads and Valbyparken, with many more on their way, as existing parks are being reshaped to receive large volumes of water during cloudbursts without preventing the everyday use of the parks or diminishing their recreational value. The plan revolves around more than 350 projects of varying size and complexity, ranging from simply knocking holes in the wharves to allow rainwater to run unhindered into the city’s canals, to excavating five giant, metro-sized storm-water tunnels under the city. Two such tunnels are almost complete, while three more tunnels are under project preparation. Projects of a smaller scale include a new system of line drains introduced in central Copenhagen at Slotsholmen, Havnegade and Toldbodgade, which direct storm water to the harbour in a separate, new pipe system, and outlets with non-return valves leading surface water to the harbour. A socio-economic assessment has been carried out to analyze whether cloudburst and stormwater management can pay off for society as a whole. The socio-economic analysis describes what the cloudburst management of Copenhagen costs society. The damage in climate change related to stormwater and torrential downpours is calculated at EUR 2 billion over a period of 100 years.  This damage was first calculated in 2010 in connection with the climate adaptation plan, and is based on a cautious estimate of the IPCC’s possible scenarios for future climate change. The construction and operating costs of a traditional sewer solution (below ground only and the alternative solution (combined underground and surface solutions) were prepared, which both meet the municipality’s service objectives concerning stormwater and cloudbursts. The cost of the traditional sewer solution amounted to EUR 2.7 billion and the alternative solution at EUR 1.7 billion, including private investment in protecting buildings and structures. Thus the alternative solution gave a positive business case. Combined with a well-protected groundwater source, it is not necessary to disinfect with chlorine, thus improving the chemi­cal quality and taste of our tap water. All pumps are energy efficient and solar panels installed at the waterworks have lowered external power consumption by 25% on an annual basis. By controlling the pressure in the supply system, replacing old pipes and running a systemized leakage detection pro­gram, the total water loss is kept at 6%. The energy consumption for supplying one m3 of drinking water (tap water) has consistently been kept at 0.3 kWh – probably the lowest for a capital city in the world. Using roof water for toilet flushing is now widely used in new office buildings, concert halls and universities in Copenhagen leading to a considerable reduction in drinking water consumption, although depending of rainfall pattern. For the new city development area, Nordhavn, with space for 40,000 workplaces and 40,000 inhabitants, toilet flushing using sea water is now standard. At the wastewater treatment plant the energy production now surpasses the energy consumption by energy efficiency in the mechanical equipment and conversion of biogas to heat and electricity. Further surplus gas is now supplied to the city gas supply system. Heat recovery from wastewater is now being tested at the wastewater treatment plant. HOFOR and Biofos are cooperating on increasing the production of biogas, by allowing the installation of kitchen waste disposers in new housing construction. In Greater Copenhagen, pipe-based and surface solutions are combined for stormwater collection and discharge across the city. 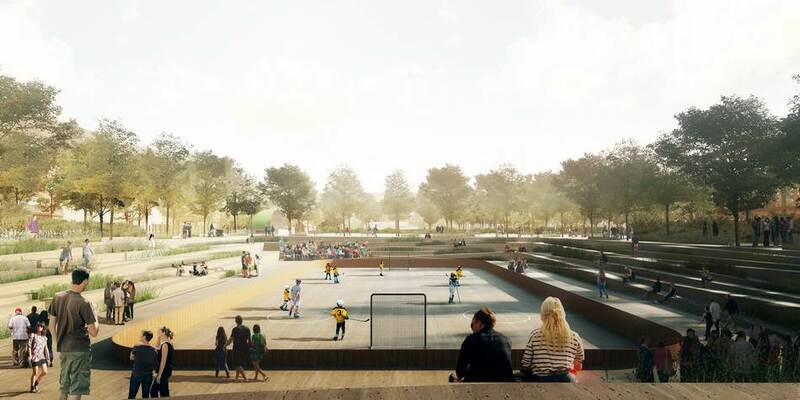 Over the next 20 years, more than 350 projects will make the Copenhagen region climate-proof. The solutions will also facilitate disconnection of rainwater from the combined system into big pipe systems to help protect the capacity of the system and maintain the bathing water quality in the harbour and at the beaches around the city. The surface solutions also create opportunities for urban space improvements and the establishment of a new, blue-green infrastructure, such as rainwater lakes and green areas where the disconnected rain water can seep down. This also helps the city combat urban heat island effects from the warmer weather. For Sankt Annæ there were already plans for upgrading the area and a cloudburst solution was integrated into the final design. The solution combines surface handling of cloudburst water with subsurface piping system that also facilitates separation of rainwater from wastewater. Some of the subsurface piping also serves as storage of rainwater for irrigating the green areas. For Enghave Park the request for retention in the area initiated a much needed upgrading of the park. Lowering of a sports ground provides thousands of retention volume for cloudburst water, and convenient seating around the lowered ground. In both projects public involvement has been substantial including public hearings, consultations of interest groups and engaging local politicians representing the local community in the city parliament. The climate neighborhood of Skt. Kjelds demonstrates how storm water management and urban regeneration goes hand in hand. 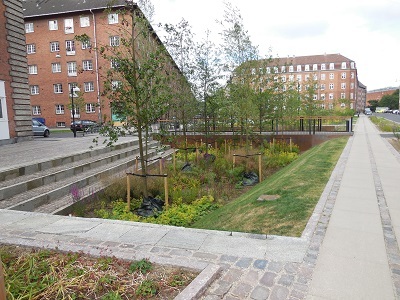 Tåsinge Plads was the first project to be constructed here – and a number of projects will be finished in the next two years creating the first fully functioning cloudburst branch – including a discharge tunnel at the very bottom of the system. Following the results of a detailed investigation of health aspects of using roof water for recreational purposes, it was decided to use roof water instead of tap water for a water playground including small fountains. The roof water was disconnected from the combined sewer system, thus reducing the hydraulic load on the local sewer system. The narrow streets in the inner dense city cannot accommodate green handling of rain water and there is no space for underground piping. The climate drains are efficient in disconnecting daily rain and provides extra hydraulic capacity within the road reserve to transport cloudburst water. 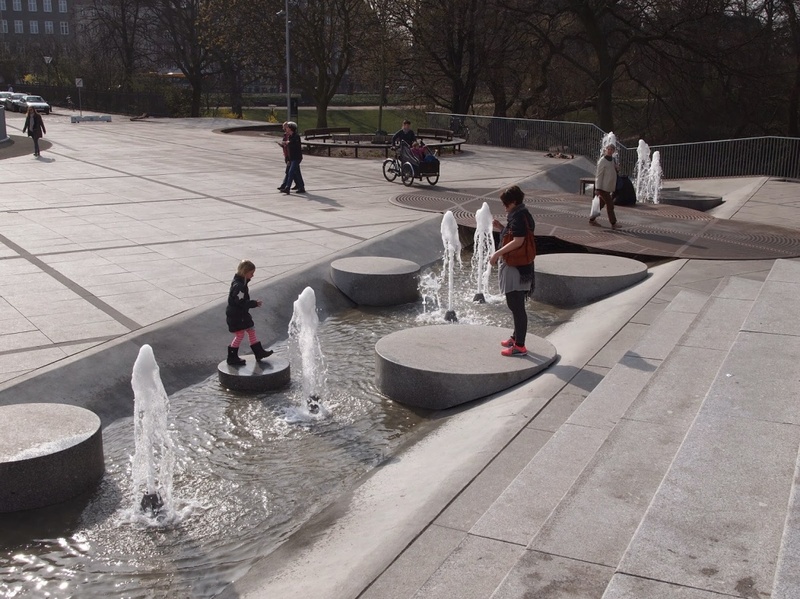 Hans Tavsens Park and Korsgade play a crucial role in the city’s plan to manage cloudburst water. Rainwater is collected and used locally while excess water from cloudbursts is lead from the park to a nearby Lake, being cleansed by city nature biotopes along local streets. Hydrological, biological and social circuits will work together in a strong symbiosis that climate proof inner Norrebro. The water management is combined with the social development of the local neighborhood currently undergoing neighborhood regeneration. The project won the final competition in the Nordic Built Competition, 2016. 	To limit carbon emissions from the operation of pumps, etc., HOFOR has set up wind turbines and solar panels on the well fields. 	Limiting water catchment for drinking-water purposes. Household consumption is now below 100 l/cap/day. 	Controlling the pressure in the supply system, replacing old pipes and running a systemized leakage detection pro¬gram, the total water loss is kept at 6%. Using roof water for toilet flushing is now widely used in new office buildings, concert halls and universities. Nordhavn, with space for 40,000 workplaces and 40,000 inhabitants, toilet flushing using sea water is now standard. At the wastewater treatment plant the energy production now surpasses the energy consumption by energy efficiency in the mechanical equipment and conversion of biogas to heat and electricity. Financial support for the establishment of installations to replace drinking water extracted outside the City with grey water extracted within the City, from roofs, or, for example, and/or wastewater purified through a UV filter. Cloudburst Management Plan to direct rainwater by gravity towards the nearest body of water, mainly the sea, if at all possible.